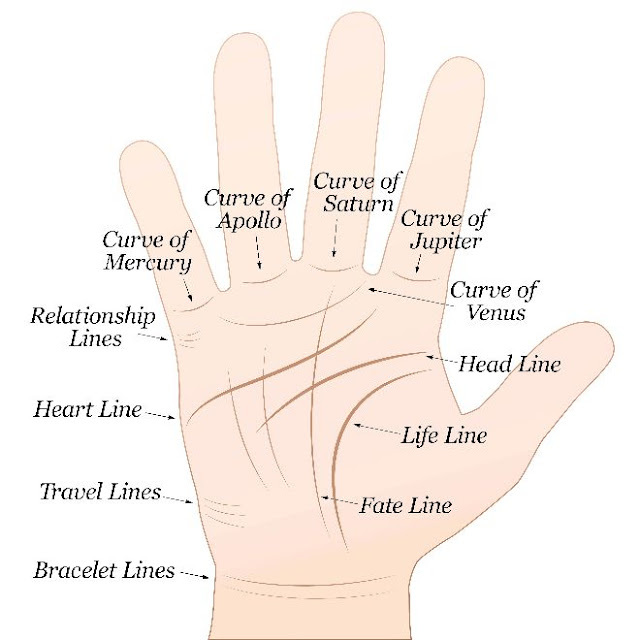 As you know, palmistry has been an ancient art of divination practiced for millenniums. But today, we are going to reveal to you a simple way to read your own palm so you can start to see into your own future. If you like personality tests like this read about how your finger nail shape affects your personality or how the gem you choose tells you your fate. Refer to the image to identify the line in your palm when doing your own analysis. As you might have guessed, this line is all about your love life. If a person has a short heart line, the person probably doesn’t place much importance on romantic relationships. But if the line is long and wavy, that person handles relationships well and with ease. If the line is straight, logic and rationality rule their love life. But a curvy-all-over heart line can indicate lots of lovers. Connected to your mind, this line represents your intellect. A short line indicates the person is more physical than mental and prefers to release energy through the body. But a long, sturdy line indicates a philosophic thinker. A wavy head line may indicate a short attention span while a straight line shows a realistic thinker. Perhaps the most famous line, “the line of destiny” represents your character and major life events not the length of your life. Deep, long lines indicate a strong-willed person with a sense of self, while shorter, shallower ones may indicate an easily influenced person. A break in the life line indicates a major life change, not death. A deep fate line indicates a person’s life may be ruled by destiny whereas a shallow one indicates a person might choose for themselves more. If your fate line has skips it in, destiny or fate may through several life changes at you. These “minor” lines can indicate how much desire you have to travel to foreign lands depending on their depth and length. If the travel lines intersect with your life line, this could indicate travel based on your health or that travel affects your health. The longer and deeper these lines are the more desire you have to travel. Also considered minor lines, there are usually between two and four below your wrist. Generally, the more you have, the longer and better life you’ll live. The deeper they are also indicates good fortune and prosperity. SHARE this post with your Facebook friends and see if they agree!